We’re lucky to have two of the best easy hikes just steps from our front door. Park Point includes a 4 mile hike through windswept pines, and a long a sandy beach with endless water views. Be sure to explore the ruins of a historic lighthouse along the way, then end at the recreation area for a picnic lunch or refreshing swim. While the paved pedestrian and bicycle friendly path, Lakewalk, has wonderful views of the city along the shoreline of Lake Superior. The 8 mile path is a flat, easy walk to the lovely Rose Garden Park. 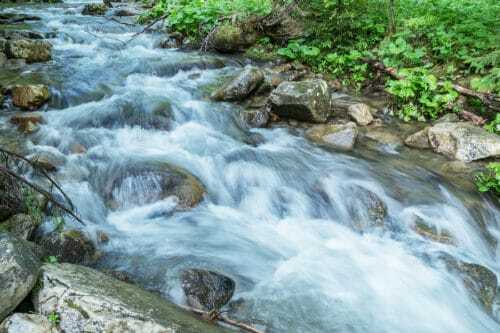 Many creeks and rivers cut through the forests of Duluth, creating interesting hikes with rocky ravines and waterfalls. Congdon Park has a 1.5 mile trail along Tischer Creek featuring charming bridges and stunning waterfalls. While the Lester Park Trail has over 9 miles of hiking from easy to challenging. The trails also have waterfalls to discover and great views of the St. Louis river. The Hawk Ridge Trails are part of a 235 acre park and bird observatory that offers educational and migration events. While exploring the miles of hiking trails with scenic overlooks, keep an eye out for the local raptors soaring by. 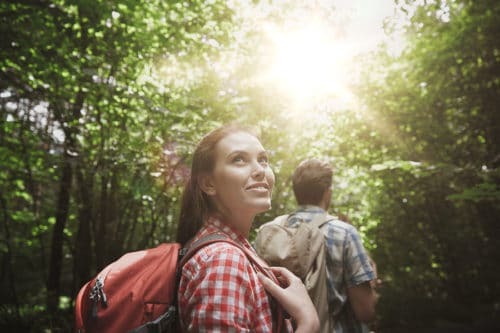 The Superior Hiking Trail includes over 200 miles of trails that begins in Jay Cooke State Park, goes through Duluth, then follows along Lake Superior to the Canadian border. 43 miles of this scenic trail winds through Duluth and sections of it make for incredible day hikes. For a less-hilly hike begin at the 660-acre Hartley Park with great views of Lake Superior. Then hike downhill to the Chester Park Trail and explore the 2.5 miles trail that features waterfalls along Chester Creek. Another great day hike begins in Lincoln Park , a 37 acre park with 1.5 miles of trails along Miller Creek with waterfalls to admire along the way. From here hike 1.7 miles to Enger Park and Twin Ponds, a 130-acre park with the five story Enger Tower that offers panoramic views at the top. From here it’s a lovely 2 mile hike through forests and down the hillside to the Lakewalk. The choice of spectacular hikes near Duluth is endless and will keep you coming back to explore more forests, waterfalls and magnificent views. 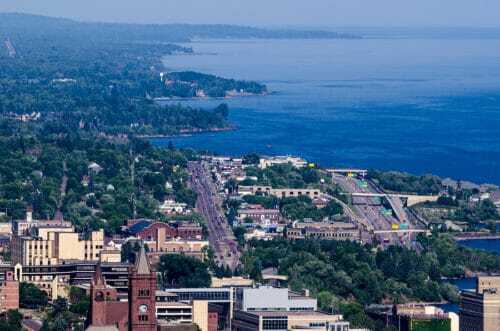 Duluth has the perfect balance of pristine hikes alongside a vibrant city, offering the best of both worlds. The Solglimt Bed and Breakfast also offers a quiet retreat that’s close to all the city’s recreation and entertainment. And our gourmet, three-course breakfast with our own unique, custom blend coffee will have you ready to hike the hills of Duluth. Book your hiking vacation with us today!